It’s a generally accepted fact that Taco Bell never puts out anything new. The last successfully trending menu items they had released were the Doritos Locos Tacos and their many iterations, and they rode that wave for as long as they could. The other new items that they’ve introduced recently had received reception ranging from lukewarm (such as their frozen drinks) to incredulous (their breakfast menu), but none have shaped up to the alleged innovation of a taco with a Doritos shell. 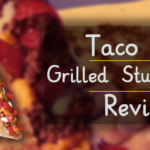 Taco Bell is extremely guilty of its mangling of Mexican cuisine, in examples like the short-lived Grilled Stuft Nacho (which used a questionable definition of ‘grilled’, was only moderately stuffed, and had very little in common with nachos). 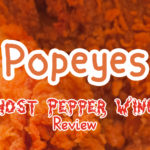 It really should come as no surprise that they’ve managed to obfuscate the basic concept of a taquito into the mouthful that is their “Rolled Chicken Tacos”, but it’s still a disappointment. When we first heard of the Rolled Chicken Taco, we have to admit we got a little excited. 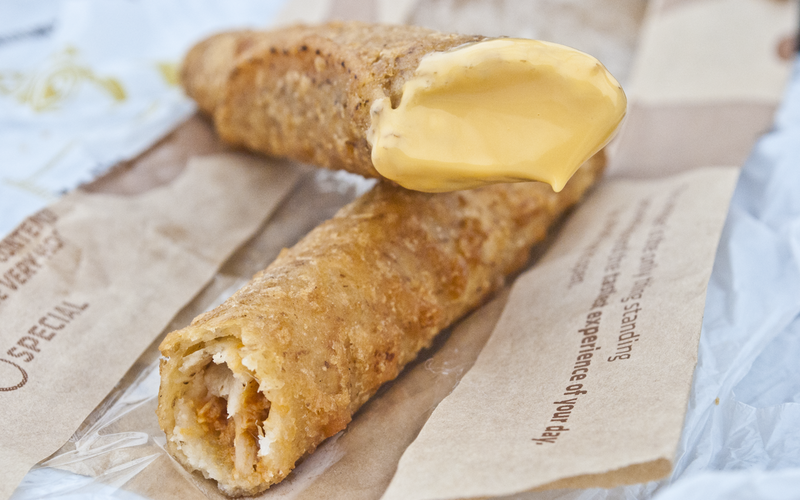 Finally, something remotely edible from Taco Bell! (Not that we have standards.) They even looked pretty tasty, featuring all-white chicken meat marinated in taco seasoning wrapped up in a corn tortilla and crispy-fried. 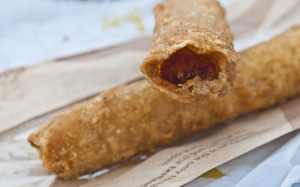 Our excitement wavered once we noticed that was all it had in it, and dipped even further when we noticed that it was going to be a whole dollar per taquito. Regardless, we pressed on, bubbling with excitement over the thought of what is admittedly one of our favourite Tex-Mex foods finally being available at Taco Bell. We felt in our hearts that these were either going to be awesome or heart-breakingly disappointing. Caution: Contents may be lukewarm. They came in a paper bag with a plastic window. 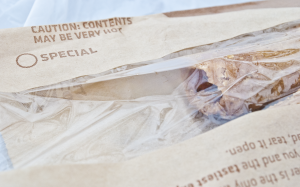 Each taquito – excuse me, “Rolled Chicken Taco” – was about six inches long, and just holding it in the bag confirmed that the tortilla was very firm and crisp. Unfortunately, the bag didn’t retain its temperature very well, and they had already lost most of their heat by the time we were ready to take a bite. Mysteriously, the nacho cheese dip was still scorching hot. Hmm. This doesn’t look like it has enough cheese on it. The shredded chicken has the pasty texture of ground meat, with only a few noticeable chunks. It has the standard flavors you’d expect out of a Taco Bell menu item: taco seasoning, generic non-spicy spices, and way too much salt. We have to say, the corn tortilla is incredibly crisp! 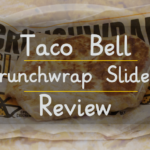 It was crunchy in a way that was satisfying, to say the least – how Taco Bell managed to pin-point that perfect level of crisp crunch in this dish must be a closely guarded secret. 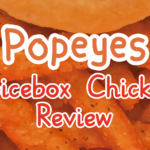 It gave the mushy chicken a much needed compliment to bring a bite of this from “meh” to “actually pretty enjoyable”. That said, the corn tortilla didn’t really add much flavor. Compared to what you would get out of a homemade taquito, this is bland. The nacho cheese dip is disgusting and plasticky as always, which appeals to Warden on a level unparalleled. The tacos definitely need to be dipped in cheese for a more balanced flavor, since the chicken is kind of sweet. We didn’t get to try any of the other dips, as the two-pack only comes with one container of sauce, so we can’t vouch for the tastiness of the new Spicy Ranch. Warden has a cheese problem. The salt content left us incredibly thirsty afterwards. Even taking bites without the just-as-salty Nacho Cheese sauce still made us feel desperate for water. Even though the marinated chicken was so moist, the salt managed to dry out our mouths regardless. Two of these is not enough for the price; if it was a dollar menu item, we would have considered buying it again. 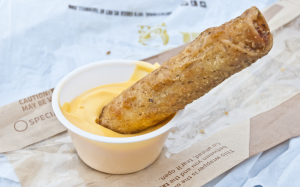 The local gas station chain has better-tasting taquitos and nacho cheese for much cheaper. Does this mean that they were bad? Not necessarily, but if it’s savings that you crave over your daily quick fix of chicken, this might be a pass. 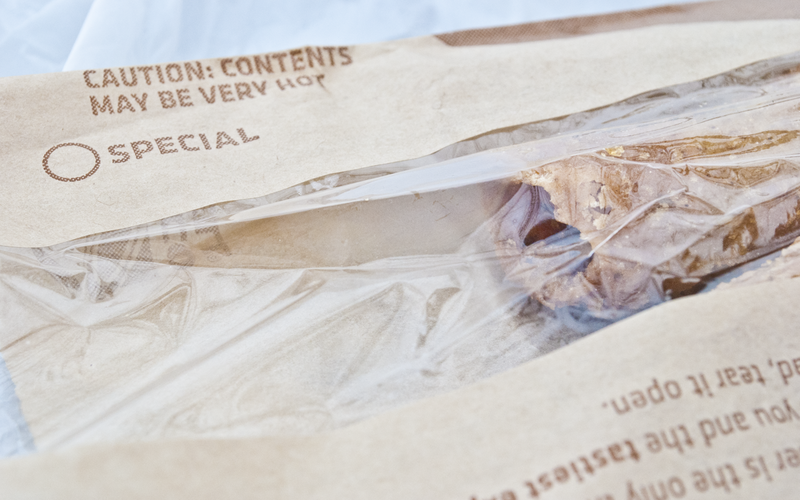 Otherwise, it was a decent enough offering, and it was nice to see something new from Taco Bell.